Your boss invites you to a conference. He sends an email letting you know the dress code is “business casual.” You haven’t a clue what that means, so you take a chance and wear your new sundress and sandals. You show up and you’re completely underdressed. You’re uncomfortable — and you worry about your boss feeling embarrassed, too. The problem is, most people don’t have a clear understanding of the different dress codes today. For example, there is no general agreement on the definition of the term “business casual.” “It depends on several factors including the industry, size of the company, number of employees, amount of interaction between employees and customers, geography, climate, culture, and average age of the workforce,” Price says. 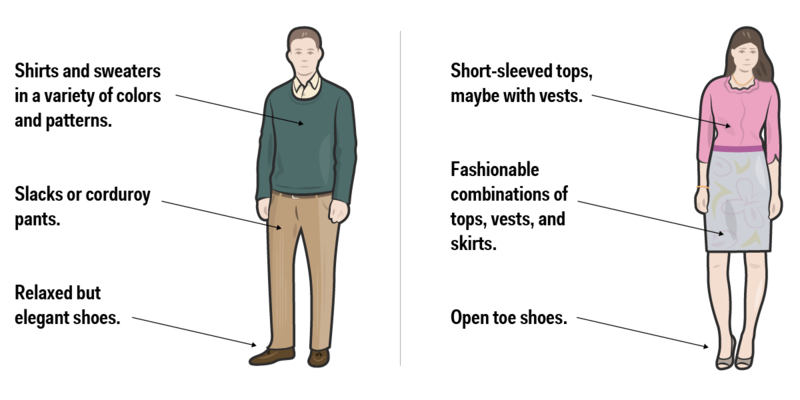 Below are examples of appropriate “business casual” outfits. Previous Post Great leader or no?